I like grand entrances. Not so much my own – although some of my acquaintance have been known to opine that I exhibit the character of a thespian manqué – but rather those of the architectural sort. When I go out to dine, it pleases me if my chosen eatery is located within a handsome building with an attractive form of ingress. If you are of the same mind, allow me to direct you to a real gem: a fine restaurant which has the noblest entrance in London. It is located opposite the Bank of England, at the heart of the City of London, and is within the august portals of the Royal Exchange. It is called Sauterelle. Some people are sniffy about the Royal Exchange. That sternest of architectural critics, Nikolaus Pevsner, thundered that it “marks the disintegration of the Classical Revival in England”. But I love it. True, its style is not pure, but a spot of eclecticism can cheer up all of us now and again. I judge that Sir William Tite, who designed it in the 1840s, did a jolly good job. Certainly, the eight columns and the giant pediment lifted my spirits as I strode up the steps, seeking my dinner. Inside, the courtyard was originally open to the sky, the glazed roof being added in 1880. Now this handsome space echoes with the sounds of those enjoying a drink and a snack at the central café. This was not, of course, my destination. I turned right and climbed to the mezzanine level and was immediately welcomed into Sauterelle by Alessandro Piombino. Mr Piombino is from Sicily and it was immediately obvious that he is a most charming and affable host. The evening had started very well indeed. Why ‘Sauterelle’? As you will know, in French the word means grasshopper. This insect appears in the family crest of the Greshams. In 1565 it was Sir Thomas Gresham who founded the Royal Exchange as a marketplace for merchants, and the story is that Sir Thomas was lost as a baby and was found only by chance by a boy who was chasing a grasshopper. I have no idea whether the great man liked his food, but I hope he did, for he is now linked by the name of his tiny saviour to a jolly good dining room. Designed by Conran & Partners (for this is part of the Conran gastronomic empire), the interior is a restful blending of greens, blues and dark wood. I settled myself at one of the small, square tables at the far end of the room. Before me was a crisp, white tablecloth. Through the glass which filled the round arch in front of me, the whole of the courtyard and the Classical details of its enclosing walls were visible. This impressive view stimulated my appetite. The menu at Sauterelle is French, a mixture of dishes both regional and classical. 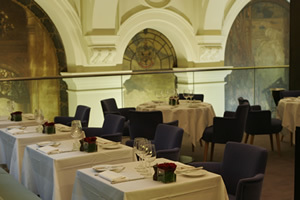 It has been devised by chef Stuart Smith, the Head Chef at the Royal Exchange. 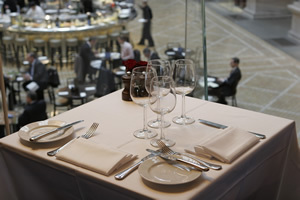 (There are several eating outlets owned by Conran within the building.) He has done a good job, for I could happily have chosen any of the dishes on offer – except the oysters, which, alas! do not agree with me. In fact, I began with seared scallops and tomatoes à la Provençale – the scallops precisely cooked and the whole tasty and well-balanced dish taking me straight to a sunny day in Provence. Then came foie gras, served in a way new to me. The terrine of liver (for two) was brought to the table in a glass pot – the sort of container in which one might buy foie gras in a shop, although this was prepared in-house – from which I and my companion helped ourselves. This foie gras was very good indeed, full of delicious, creamy richness and accompanied to good effect by pieces of poached pear. About 70 wines are offered on the list. Still whites range in price from £16.50 for a Languedoc (Picpoul de Pinet, Dom. des Lauriers, 2004) to £95 for a 2001 Beaune (Clos des Mouches, Joseph Drouhin), and reds from £18.50 for an Italian from Puglia (Salice Salentino, Cantine Due Palme, 2003) to £110 for the 1983 vintage of Chateau Beychevelle. Those of you who wish to sparkle can do so with non-vintage Taittinger at £47.50, 1995 Dom Perignon at £350 or 1989 Louis Roederer Cristal at £375. For my own drinking, I went to the New World. I am one of the few people on this planet who likes to drink chardonnay with foie gras. But, of course, it has to be full-bodied, creamy chardonnay with neutral fruit – and my bottle from South Africa was precisely that (Jordan Estate, Stellenbosch, 2003 - £30). Wonderful. My red was from Western Australia, the highly regarded Art Series cabernet from Leeuwin Estate. This was the 2000 vintage – soft, fruity and quite elegant, but without the complexity for which I was hoping (£70). I wish there were more French restaurants like this in London. Real French dishes, with good quality ingredients, properly prepared and carefully served (here by cheerful waiters and waitresses in black aprons), are becoming too rare in our city. Yet they afford much delight. I think it would be well nigh impossible to go to Sauterelle for dinner without achieving a very high measure of enjoyment. And, of course, as I realised on my departure, the grandeur of the entrance is matched by the grandeur of the exit. The Courtyard, The Royal Exchange, Bank, London EC3V 3LR, England.